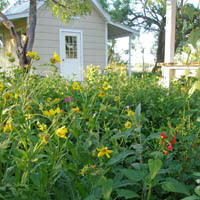 People often want to know what kind of short grass they can plant under their shade trees. Our answer is, “You can’t…” At least not without using exotic imported grasses that require extensive fertilizing, pest control, watering and mowing. And after all that work it might die during the next hard freeze! Our advice is to take a more natural approach to life under the trees. These annuals and perennials are a few of the understory plants that thrive in the shade or along woodland edges. Will also grow in sunny area!